GIS and GPS integration is happening in research and commercial activities worldwide, however this is the first GIS-GPS integration book to look at applications that combine GIS and GPS to provide one solution. It begins by providing readers with technical overviews of GPS and GIS and their integration, and then focuses on a selection of R&D activities in applications ranging from intelligent transport systems to real time location based tourist information systems. 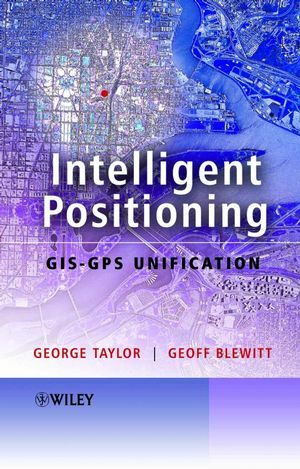 George Taylor is the author of Intelligent Positioning: GIS-GPS Unification, published by Wiley. Geoff Blewitt is the author of Intelligent Positioning: GIS-GPS Unification, published by Wiley. 1. Do You Really Know Where You Are? 2. How Active Is Your Map? 3. Levels of GPS-GIS Integration. 4. Overview of the Book. 5. Spatial and Geographical Data. 8. GIS and the Internet. 9. The Application of GIS. 3. Point Positioning Using Pseudorange. 4. The Carrier Phase Observable. 4.2. Carrier Phase Observation Model. 5. Relative Positioning Using Carrier Phase. 5.2. Baseline Solution Using Double Differences. 6. Introducing High Precision GPS Geodesy. 6.2. Sources of Data and Information. 3 Datum Transformations and Projections. 2.2. International Terrestrial Reference System (ITRS). 2.4. Cartesian to Ellipsoidal Transformation. 2.5. Ellipsoidal to Cartesian Transformation. 2.6. Relative Coordinates: Cartesian to Topocentric. 2.7. GPS Estimated Errors: Cartesian to Topocentric. 3.3. Converting Latitude and Longitude to UTM. 3.4. Orthometric Height ‘Above Sea Level’. 4 Commercial Applications That Integrate GIS and GPS. 2. National GIS/GPS Integration Team. 3. GIS and GPS Deformation Monitoring. 6. Accessible Rural Public Transport (Case Study). 7. Realtime Passenger Information and Bus Priority System. 5 GPS-GIS Map Matching: Combined Positioning Solution. 3. Road Reduction Filter (RRF) Map-Matching Algorithm. 3.3. Determining the Correct Road Centre-line. 6 Intelligent Map Matching Using ‘Mapping Dilution of Precision’ (MDOP). 2. Least Squares Estimation of Position Error Vector. 3. Quantifying Road Geometry: Mapping Dilution of Precision (MDOP). 4. MDOP for Basic Road Shapes. 7 The Use of Digital Terrain Models to Aid GPS Vehicle Navigation. 3. Spatial Interpolation of Elevation Data. 4. Map Matching and the Road Reduction Filter. 4.1. Road Reduction Filter (RRF). 5. Data Collection and Processing. 6.1. Height Errors – Test 1. 6.2. Position Errors – Test 1. 7. Results from Test 2 Data with a Subset of Satellites. 7.1. Position Error – Test 2. 8 GPS Accuracy Estimation Using Map-Matching Techniques: Application to Vehicle Positioning and Odometer Calibration. 5.1. Weighting Scheme for w<sub>i</sub>. 5.2. Implementing the Correction Factor Algorithm. 6. Calibration if GPS Data Is Recently Online. 7. Putting it all Together. 8. Alterations to the Correction Factor Algorithm. 11. Data Processing and Results. Algorithm 1 Estimate Location of Bus from Odometer Signal. Algorithm 2 ‘Distance3d’ Function Used by Algorithm 4. Algorithm 3 Update the Value of C<sub>t</sub>. Algorithm 4 Update the Value of C.
Algorithm 6 Overview of Events.